He’s Not My Quarterback…He’s My Linebacker! Is your football defense getting dominated up the middle and outrun around the ends? If so, maybe you have the wrong athletes playing linebacker. According to Sports Illustrated, the latest trend in defense is to emphasize speed over size when selecting linebackers. The position is so important in defense, that many coaches are putting their best players – from both offense and defense – in that position. Where do you find these players? Possibly among your tailbacks and even quarterbacks. Joe Lemire, High School Football, Quick Hitters, Sports Illustrated, September 10, 2007. 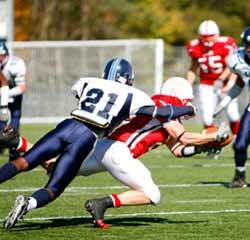 This entry was posted in football, linebacker, physical education, sports by Richard Moss. Bookmark the permalink.